The Chicago Bears’ offense has been tamed in a big way over their past two games, but coming out of their bye week and preparing to face the Green Bay Packers, they may be facing yet another obstacle to overcome. 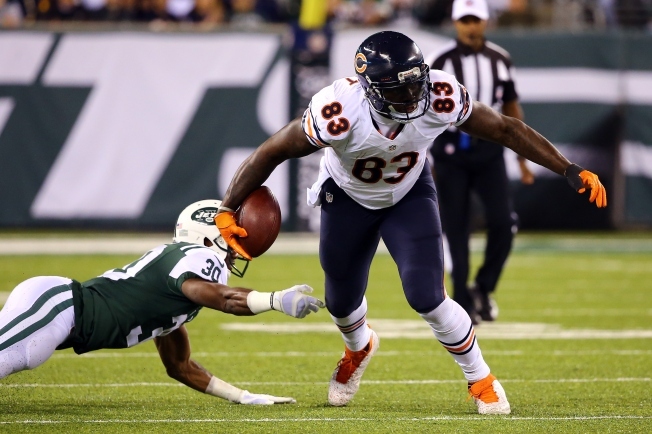 That’s because tight end Martellus Bennett, who has been one of the team’s most consistent performers in the first half of the season, was limited in practice Thursday with a rib injury. He wasn’t on the injury report on Wednesday, so this is definitely a bit of unwelcome news for a Bears team looking to climb back into the NFC playoff hunt. After starting off the year in hot water following a heated confrontation with rookie cornerback Kyle Fuller in training camp, Bennett has been one of the team’s most important offensive players. With 47 receptions, 517 receiving yards, and five touchdowns, Bennett has become a huge threat over the middle of the field, and opposing defenses have struggled to find ways to shut him down. He’s fast enough to elude linebackers, and he’s big enough that he can overwhelm nickel corners as well. It’s not clear at this point how much the injury will affect Bennett, but going into a game where the Bears will need to score plenty of points, it’s definitely bad news to hear that he’s struggling with an injury at this point in the week.